What is the Guiding Thought telling me today? I feel like it’s giving me a clue that I will figure out at some point in the future. I’ve been feeling that a lot lately (and especially on this Journey): that I am being guided, following clues whither they may lead. Interestingly in accordance with the Guiding Thought, in my usual meditation this morning I included light-meditation. 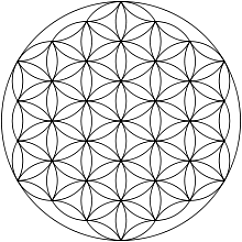 First, I pictured a white-light Flower of Life encircling me, with its center at my navel. It represented creation and protection, or attraction and protection, in the sense of attracting what I am “creating”. Protection was about transforming harmful thoughts within, as well as being a protective barrier from harmful influences without. It was like a 2-way dream catcher, catching negative energies before they could reach me, and releasing negativity, or like a cell wall which allows in nutrition and oxygen lets out the “waste” of carbon dioxide. Then I pictured a golden light encircling me, its center at my heart. You know how paintings of spiritually advanced people are often painted with a circle of light around the head? I wondered if those small circles of light in the pictures represent a much larger circle which would fill the space all around the person. I moved my attention up and “saw” two circles of light with centers at my forehead and the top of my head. I know this is beginning to sound like a chakra meditation, but interestingly, the light at my head did not correspond to chakra colors. The one at my forehead was a pastel pink, the one at the top of my head a pastel blue. I thought, “That can’t be right…” and tried to visualize them in the “correct” chakra colors, but it felt wrong, so I let them stay pink and blue. This is part of why I said a moment ago that I think the Guiding Thought is trying to tell me something, is giving me clues. What is the clue about pink and blue head-chakra lights? More and more, recently, I am noticing things like this, that have no apparent rhyme or reason in the moment—like the peacock and the caterpillar—but that make a whole lot of sense a week or two (or three) later. I am learning patience, learning to watch and allow myself to be guided. I am learning to follow. I’m learning “to sit peacefully in the still place of nothingness as life moves quickly around me”…and the clues continue coming. I ended my meditation this morning thinking about God expressing through me, as me. Who am I to understand the entirety of God and Her/His expressions? Who am I to know how all the pieces fit in perfect Unity and Completion? I am enjoying being lead and enjoying simply following. It’s like the start of a whole new journey. Just after finishing the Journey this morning, I had some time before I had to get ready for work, so I picked up the book, The Divine Mother Speaks: The Healing of the Human Heart, by Rashmi Khilnani. I came to a place that says, in essence, exactly what I wrote about above. It was like an immediate affirmation of everything I had written, including the part about finding clues—by affirming my clues! It really makes me chuckle how “stuff shows up”. Here is what I read (Speaking about lessons to be learned from the Sphinx): You connect strongly to the energy of patience, to the energy of detached witnessing, and to the energy of nonjudgmental observation…Patience is the calm acceptance of Divine timing and of the eternal nature of all things beyond time. The tendency of the mind is to push you into impatience, which then leads to frustration and disease. The intrinsic nature of your human heart in its depth of Divine connection is patient, ever patient. I began the Journey today noticing clues…then I went into patience…then I ended with patience about how the pieces fit (“Divine timing”); do you see it? Maybe it’s just me, but when I read the words from The Divine Mother Speaks, I felt like the book was telling me, in different words, exactly what I had just written. I also don’t think it’s coincidence that the last line of the above quote is about the nature of the heart, and yesterday’s Journey was all about the heart.